Crafty Day 2012: Food, Drink, Crafts, and Friends! The last time the holiday gathering that we call Crafty Day was written about on this blog was way back in December of 2010. That is not to say that we didn’t celebrate Crafty Day in 2011, I just never got around to writing about it. In a nutshell, our good friends Patty and Rob invite us to their home for an afternoon and evening filled with food, drink, crafts, and most important of all, quality time spent with some of our oldest and dearest friends. Since Patty and Rob are kind enough to host and let us make a mess of their lovely home, it is my job to always bring a wide assortment of food for lunch. My annual trip to the Reading Terminal Market and our local Italian grocery store (Croce’s in Cherry Hill, NJ) to gather provisions for Crafty Day is a shopping excursion that I always look forward to. For this year’s event, the Women of Crafty Day (Patty, her sister Sue, and Mrs. G-LO) decided that they would be making homemade Vanilla Extract, which would prove to be one of the easiest crafts that the ladies have ever undertaken. Take four vanilla bean pods. Split them. Stuff them into an 8 ounce Boston Round bottle. Fill the bottle with Vodka. Wait two months. And then Voila! The Vanilla Extract, she is done! I am really looking forward to seeing how it came out (once again, I am a sucker for pretty packaging). While the ladies were toiling in the kitchen, the boys (Rob, Sue’s husband Rash, and I) were working on this year’s batch of Limoncello while we sampled a wide array of whiskies (I brought the Balcones, Brenne, Angel’s Envy, and a Scotch Malt Whisky Society sample since I knew they would be something new for the boys to try). Crafty Rob (he makes his own wine and occasionally homebrews) supplied us with vegetable peelers and quickly put us to work as we imbibed. Thankfully, no fingers were lost as we peeled our lemons and drank our drinks. Our next gathering will hopefully involve the dilution and bottling of Rob’s lemon peel and Everclear concoction. At around 6PM, we did what all good gluttons do after an afternoon of eating and drinking: we ordered a plethora of Asian food! Wonton soup. Dumplings. Sushi. Spare Ribs. A medley of stir fries. If you can think of it, it was probably there! At this point in the evening, we also stopped with the adult libations and moved on to the lighter side of the beverage spectrum, i.e. lots of water and a caffeinated soda or two, because once the party is over, we still have an hour long drive home. Once again, Crafty Day was a huge success, and fun was had by all. We are already counting down to next year’s event! And for your viewing pleasure, here are some photos of all that went down on that rainy, foggy Saturday in early December. Happy Holidays! The lunch time spread! Cured meats. Cheeses. Salads. Stromboli. Marinated vegetables. Oh my! This is how the men stayed hydrated as they worked on their craft. 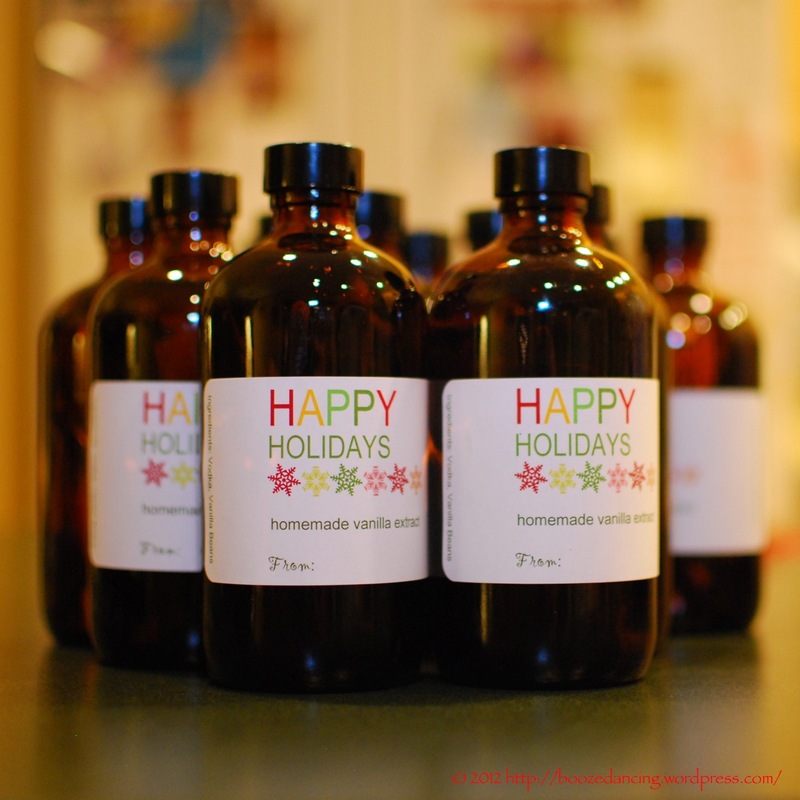 Homemade Vanilla Extract by The Crafty Ladies of Crafty Day. This is what happens when Rob has a “What should we do with all of the leftover Everclear?” moment. Sue’s 2012 Crafty Day Punch! Aperol, Prosecco, and a couple secret ingredients. 100% refreshing! The peels from 40 lemons, limes, and oranges plus oodles of Everclear! Still don’t think whisky is the way to stay hydrated. And, it looks like you may have wasted a fair amount of vodka and everclear. Cured meat and stromboli, though … that looks so nice! Perhaps the Whisky quenches a different kind of thirst. A spirit-ual one. So tell me — is homemade limoncello really as easy as Everclear and lemon peels? If so, my life is about to change in a beautiful way. Looks like a fantastic tradition and a great way to spend time with friends! Lemon peel and Everclear and waiting about a month or two (not exactly sure but can find out) is step one. Step two is diluting it with simple syrup. I never got to do that part. The Everclear was 151 proof and you should probably get it down to around 90 proof which should keep it from freezing since you’ll want to store it in the freezer. A friend of my in-laws makes a pineapple version which is really good too. You need to check out the Boozed and Infused blog. They do some fun infusions over there! And yes, it is one of the few reasons why I look forward to the Holidays. You can keep the gifting and shopping. Bring on the food, drink, and good times with friends and family! Thanks for the comment! Cheers and Happy Holidays! Oh, I love Boozed and Infused — they’ve given me so many lovely ideas! I think my New Year’s resolution will be to make a new infusion (on a small scale) at least once or twice a month. Thanks for the limoncello tips! Anytime! Always happy to help a fellow aficionado of all things delicious.